This is by no means a comprehensive list, it's just what my experience has taught me. When looking at it, make sure the owners don't have it in some dark corner without good lighting so that you can't spot all the flaws. If it is, ask that a light be brought in or move the loom to the light. Bring a flashlight in any case and also bring a ruler. Check to see that all the beams are parallel to each other. Measure from corner to corner on the diagonal in both directions. The measurements should be identical. Is anything warped? 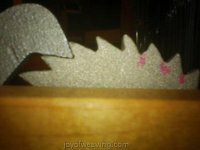 If any parts are warped, consider if it would be an easy fix (either by straightening it or replacing it). Are the cables and pulley wheels in good condition? Check to see that they're all there and that they work. If cables are broken/missing, consider if they are easy to replace. Check to see if any wooden pulley wheels aren't broken, chipped or otherwise damaged. If they are, are they easily replace? 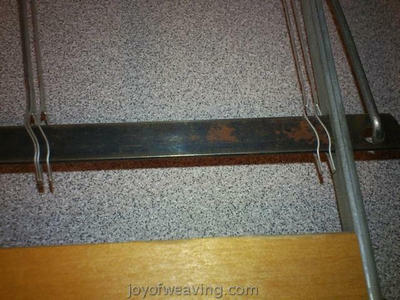 Cosmetic damage will not affect the function of the loom and can either be left the way it is or you can pretty it up. Consider how bad it is and whether or not you can live with it. Does it have beater bumpers? Those are the little rubber dohickeys that cushion the top of the beater as it rests back against the castle. They protect the beater and soften the noise when the beater is returned. Make sure those are present and in good shape. If they're not in good shape, consider if they are easily replaced or not. 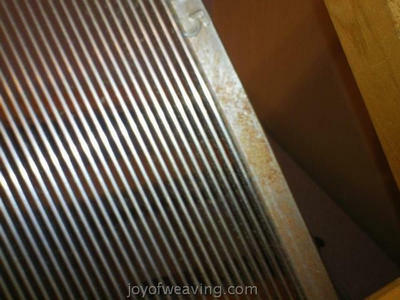 Rust is a loom's nemesis. Check for this very carefully. here's some examples of rust. This was all cleaned up easily with a little bit of steel wool. More severe rust can be removed either with electroisys, white vinegar, or "Naval Jelly". I'm not a fan of Naval Jelly as it's a carcinogen (read the label carefully) so I try to resort to other methods first. Do the ratchets work? Turn the handle one click and back wind to make sure all the teeth on the ratchet seat properly and do not slip. 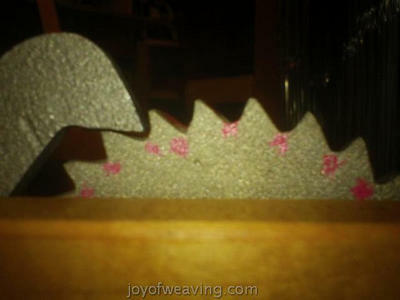 The teeth with the pink dots on this ratchet at the cloth beam are defective and the pawl slips. You can see the difference between the bad ones and where it seats properly on the good ones. This was an easy fix. All I had to do was move the pawl. 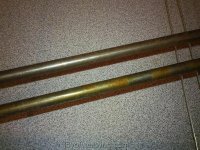 Check to see if it's rusted and/or pitted, and if the metal pieces are bent/missing, etc. Sit at the loom and try the treadles. Check the height and see if it's right for your size. 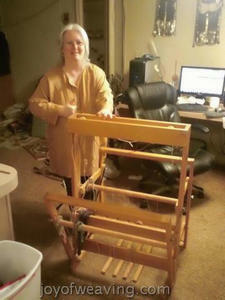 This is something I didn't consider when I got my first loom and it turned out to be too high for me. If the loom is not in working order so that you can try it, see if you can get them to put it in working order and if not, and you're still interested, see if you can get them to come down in price and take your chances. Best of luck on your used loom purchase! I hope this article has helped you.